Fig. 3-14. 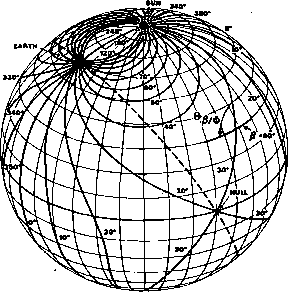 Hohmann Transfer Ellipse. Note that direction of thrust is opposite the direction propellant is expelled. From the first form above, it is clear that the transfer time is somewhat less than half the mean period of the two orbits. The Hohmann transfer time from low-Earth orbit to synchronous altitude is 5.23 hours and to the orbit of the Moon it is 4.97 days; for these large differences in period, Eq. (3-19) overestimates the time by 4% and 11%, respectively. where a, may be either a, or a2. (In the case of a Hohmann transfer leaving or approaching a planet or other massive object, |A V\ is the hyperbolic velocity of the spacecraft relative to thé planet.) Values of the transfer time and velocity change required for trips between the orbits of the planets are given in Table L-10. As an example of a Hohmann transfer, we consider a flight from the Earth to Mars for which the Hohmann transfer time is 259 days. (The approximation of Eq. (3-19) is in error by less than 0.1%.) As shown in Fig. 3-15, the spacecraft will move 180 deg in true anomaly in 259 days to meet Mars at point C'. The Earth will have moved (259/365) of an orbit or 255 deg in true anomaly. Thus, the Earth will be 255-180 = 75 deg ahead of Mars when the spacecraft arrives. From Table L-l, we find that the mean daily motion in true anomaly of the Earth is 0.462 deg/day faster than that of Mars. Thus, opposition occurred 162 days ( = 75 deg/(0.462 deg/day)) before arrival when both planets and the Sun were on a straight line. This fixes the mission timing relative to the synodic period of the Earth and Mars. We conclude that flights to Mars should leave Earth 259-162 = 97 days before an opposition of Mars and arrive at their destination 162 days after opposition. Actual flight times will differ from this estimate by several weeks due to the noncoplanar, noncircular orbits of the Earth and Mars. To calculate the energy and velocity changes required for a Mars trip, we must further specify the initial conditions because it will be necessary to account for the gravitational attraction of the planets themselves. We assume that we wish to leave from the surface of the Earth and enter a circular orbit just above the surface of Mars. From Tables L-l 1 and L-10 (or Eqs. (3-6) and (3-20)), the escape velocity of the Earth is 11.18 km/sec and the hyperbolic velocity necessary to achieve a Hohmann transfer orbit to Mars is 2.9 km/sec. Therefore, a Mars probe requires an initial energy change of 0.5 x 11.182+0.5 x 2.9*=66.70 MJ/kg. (This may be supplied, for example, by either one velocity change of 11.55 km/sec (=(2x 66.7)'/2) or, less efficiently, by an initial velocity change of 11.18 km/sec and a second change of 2.9 km/sec after the spacecraft has left the vicinity of the Earth.) From Table L-10 or Eq. (3-20), we find that the spacecraft approaches Mars with a hyperbolic velocity of 2.6 km/sec or a total energy per unit mass of +3.38 MJ/kg relative to Mars. From energy conservation, the velocity as the spacecraft passes near the surface will be (2E+2p/R)1/2=(2E+2 V? )1/2, where £ is the total energy per unit mass, Ve is the circular velocity of Mars, or 3.55 km/sec from Table L-l 1, and ¡i and R are the gravitational constant and radius of Mars. Thus, the velocity near the surface of Mars will be (2x3.38+2x3.552),/2=5.65 km/sec and a velocity change of 5.65-3.55=2.10 km/sec will put the spacecraft into a circular orbit just above the surface of Mars. Without this velocity change, the spacecraft would follow a hyperbolic trajectory away from Mars and return to an elliptical orbit about the Sun. Similarly, a velocity change of 2.10 km/sec is required to return the spacecraft to a Hohmann trajectory back to Earth. An analysis similar to that described above applies to elliptical orbits as well as circular orbits. Thus, raising or lowering the apogee height is done most efficiently by firing the propellent antiparallel or parallel to the direction of motion when the spacecraft is at perigee. Similarly, perigee height is adjusted by maneuvers at apogee. In general, plane change maneuvers are more complex than transfer maneuvers within the orbital plane. However, some general characteristics of plane change maneuvers may be determined from the orbital properties described in Section 3.1. Any change in the orbital plane requires a velocity change perpendicular to the initial orbital plane. Because the orbital plane is defined by the velocity vector and the radius vector from the primary to the spacecraft, the general effect of any instantaneous plane change maneuver is to rotate the orbital plane about the radius vector from the primary to the spacecraft. The amount of this rotation is defined in Fig. 3-16. From the figure, we see that a given velocity change provides the maximum orbital rotation when the component, Vlx, of the initial spacecraft velocity perpendicular to the radius vector is a minimum. By Kepler's Second Law (Conservation of Angular Momentum), this occurs at apogee. Of course, the initial and final orbital planes must contain the radius vector to the spacecraft at the time of the maneuver. Therefore, a single impulse maneuver (i.e., one which is nearly instantaneous) must occur whenever the spacecraft lies at the intersection of the initial and final orbital planes. Fig. 3-16. Rotation, 0, of the Orbit Due to Velocity Change AK. 8 is measured in the plane of the paper which is perpendicular to the radius vector, K,=initial velocity, fry" final velocity. J. indicates components perpendicular to the radius vector. The most straightforward plane change is a change in the inclination of an orbit A plane change maneuver performed when the spacecraft is at ascending or descending node will rotate the orbit about the line of nodes, thus changing the inclination without changing the right ascension of the ascending node (except for possibly interchanging the ascending and descending nodes). It is possible for a maneuver at this location to change only the inclination and not affect any of the other orbital elements. It can be shown that inclination changes are most efficiently done when the spacecraft is on the line of nodes. (See, for example, Ruppe .) Maneuvers that change the ascending node but not the inclination or other parameters must be made at one of the two locations which the initial and final orbits have in common. Most orbit maneuvers require the expenditure of rocket fuel or other spacecraft consumables to make significant modifications in the spacecraft orbit. However, in gravity assist trajectories or flyby trajectories, the orbital velocity of a planet is used to change the spacecraft orbit. On a hyperbolic trajectory, a spacecraft will approach and leave the planet at the same speed relative to the planet but in a different direction. Thus, the interaction with the planet is an elastic collision analogous to a baseball and bat and can be used to provide additional energy to a spacecraft. If a spacecraft approaches a planet at 5 km/sec relative to the planet and leaves at 5 km/sec at an angle of 90 deg relative to incoming velocity vector, it will undergo a velocity change of 5^2 «7.07 km/sec. where q is the perifocal distance or distance of closest approach to the planet and li= GM. Table 3-4 lists the values of the turn angle and velocity change assuming that the hyperbolic velocity is the velocity of approach for a spacecraft in a Hohmann transfer orbit as given in Table L-2. A Venus gravity assist trajectory was used by Mariner 10 to explore Mercury. However, Jupiter is the most efficient planet in providing large velocity changes. Jupiter flybys can be used in several ways—to give a spacecraft sufficient added energy to become an interstellar probe (Pioneer 10), to reduce the transit time to the onter planets (Pioneer 11 and the 1977 Jupiter-Saturn mission), to obtain a large velocity component perpendicular to the plane of the ecliptic in order to explore the space "above" or "below" the solar system (also Pioneer 11), or to reduce the spacecraft velocity perpendicular to the direction of the Sun (and, therefore, the spacecraft's angular momentum) in order to approach the Sun. Injection Conditions. The Keplerian orbit of a spacecraft is determined entirely by its position and velocity at any one time. This is of relatively little interest for practical orbit determination because position and velocity are not noimally observed directly. However, determining the Keplerian elements from position and velocity is convenient for a variety of analytic studies involving the effect of injection conditions or orbit maneuvers or the determination of approximate elements from data in ephemerides. Thus, we will assume that we are given the radius vector, R, from the center of the Earth to the spacecraft and the velocity vector, V, at some time, t. We wish to determine the Keplerian elements, a, e, i, to, Q, and M. These computations are performed by subroutine ELEM described in Section 20.3. Table 3-4. Representative Turn Angle, <;>, and Velocity Change, AK, lor Flyby Missions to the Planets. The assumed hyperbolic velocity, Vh, is velocity of approach for a Hohmann transfer orbit (from Table L-2). 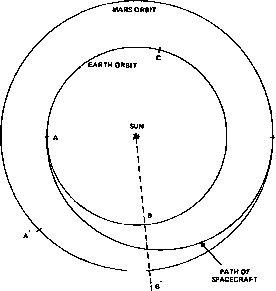 RP is the radius of the planet and q is the perifocal distance or distance of closest approach.